Helicopter charter is an ideal solution for business people planning a trip to a variety of locations around the M25. It avoids expected, or unexpected, delays and makes efficient use of a person’s time. If you have a particular trip in mind please give us a call or get a quick estimate below. 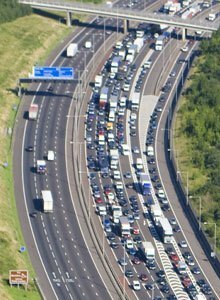 The M25 is one of the busiest motorways in the UK, with an average of over 200,000 vehicles taking to the road every day. Maintaining the surface requires a good deal of roadworks operations, resulting in constant hold-ups and delays. A report in June 2013 found that the motorway has not managed to go through a single day without closures in the past three years! Every day, thousands of executives bound for the capital become stuck in an M25 gridlock, resulting in delayed meetings and unwelcome stress. But there is another way – flying high above the traffic queues in the comfort of a helicopter. Helicopter charter is a smart and efficient method of visiting many locations in one day. From business meetings and conferences, to branch visits and events. You can be picked up from a location near your home or office and flown straight to your appointments around the London area, neatly sidestepping the M25’s hectic traffic (and the inevitable roadwork delays). Relax in the seclusion and comfort of the helicopter cabin, with nothing to steal your attention away from business matters. You can arrange a much more efficient schedule, arrive feeling relaxed and ready to take on the day – and with no need to keep an eye on the clock, just to avoid delays before the next meeting, you can concentrate to your staff and job in hand. With the time saved gives business people the ability to fit more appointments and tasks into a day, increasing productivity. To find out how much is possible and book your helicopter travel, call Atlas Helicopters today or get an online estimate below.